I came to Provo and BY High in the fall of 1920. At that time, there was no high school in my home town of Lund, Nevada so my father sent us to various Utah schools. I was very proud to be a junior at this time. As I was finding my way around that first day, I met a friendly young man who asked my name, where I was from and what year l would be in school. I proudly told him I was a junior. That night he danced with me at the opening social, a one-time happening. Later I learned the young man was Ernest L. Wilkinson. He was a college junior and editor of the school paper. Years later he became President of Brigham Young University. I realized my station as a high school junior one day when I heard the college boys, who ate their meals where I was boarding, talking about school. Archie West said, "I don't think the high school should have a Junior Prom -- that should be an honor reserved for college students!" I kept quiet but had learned my lesser status as a high school junior. However, we high school students were free to enjoy all the wonderful school activities, ballgames, plays, programs, dances, even the great Junior Prom. In thinking of the Academy Building, I remember the huge stairway coming down the north side of the main hallway and how I ran down it each day as I came from my sewing class. One day, as I was half way down the stairs, the big 20-foot door on the west opened and in walked Leland Hendrix, from my home town. Being the only person around, I was able to show him to the office just left of the front door. Registration was simple in those days. Leland became a member of the Men's Glee Club, an elite singing group, and sat next to Richard Condie who later became director of the Tabernacle Choir. A few years later, Leland and I were married! But I'm getting ahead of myself. One morning I started to run down that long stairway and found myself falling head first down a dozen or so steps. I had worn dress shoes with a little higher heel than my oxfords; one heel caught on the metal trim of the steps and I was thrown down with quite a force. I didn't stop to assess my injuries, but looked around to see if anyone had seen me fall. Luckily, there was no one in sight, so I gathered myself together. I looked back up the stairs and could see my shoe still hooked to the step at the top of the stairs. I went up the stairs and retrieved my shoe and made it safely back down the stairs, happy that no one had seen me fall. I soon forgot the bruises. I had such a wonderful winter that year at BY High. How I enjoyed the Friday-night dances! 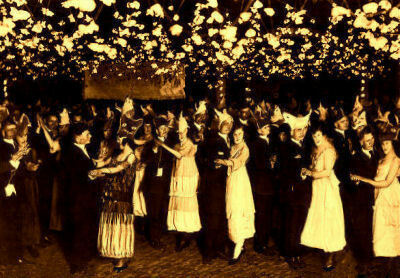 Dancers wore crazy hats at this highly-decorated BY High School "Fools Frolic" dance in the 1920s. And thanks to the half dozen college boys who ate their meals at my place of residence, to Leland, and to my brother Ernest Gubler, also at BY High, my dance program was always filled. What wonderful memories of BY High and Academy Square! Laura Gubler was born on September 3, 1904. Her parents were Jacob John Gubler and Mary Agnes Horsley. Her father graduated from Brigham Young Academy's high school Commercial program in 1895. Laura Gubler came to Provo from Lund, Nevada, and was a junior at Brigham Young High School when she attended in the 1920-21 academic year. She then transferred to Brigham Young College in Logan, Utah, where she completed her senior year in high school in 1922. She then completed a year of college there in 1922-23. Next she enrolled at the University of Utah, where she attended as a college sophomore. She graduated from the University of Utah with a two-year Associate Degree in Education. Leland Hendrix, also of Lund, Nevada, was born on August 15, 1897. Laura Gubler and Leland Hendrix married on March 15, 1924 in Ely, Nevada. They were later sealed in the Salt Lake Temple. They lived and farmed in Lund, Nevada, until 1958, when they moved to Utah, settling in Orem, Utah. They filled many Church callings. Together they served a short-term mission to the Southern States, and later were ordinance workers in the Provo Temple for 15 years. Together they had five children, and many grandchildren and great-grandchildren. Leland Hendrix died on January 11, 1997. His interment, Lund Cemetery, Lund, Nevada. On September 3, 2012, Laura Gubler Hendrix celebrated her 108th birthday! She particularly enjoys sending and receiving email. Laura Gubler Hendrix, 108, our loving mother, grandmother, great grandmother, and great great grandmother, gratefully returned to her Heavenly Father on May 5, 2013. She lived a long event-filled life. Born on September 3, 1904, she saw everything from horse and buggy to supersonic jets. She is the fifth child of Agnes Horsley Gubler and Jacob J. Gubler. Her brothers were Ray, Ernest, Charles, Albert, and Ralph. They are all deceased except Ralph. Her sisters were Ina, Ruby, Mable, Olive, and Ivy. They are all deceased except Ivy. She married Leland Hendrix on March 15, 1924. He preceded her in death. She is survived by her daughter Ludean (Phil) Carter of Lund, Nevada, her son Leland (Eve) Hendrix of Mapleton, Utah and her daughter Claire (David) Julian of Memphis, Tennessee. She was preceded in death by her oldest daughter Vaiola, her daughter and son-in-law Elaine (Sam) Doxey, and four grandchildren. She is survived by nine grandchildren, 34 great grandchildren, and 41 great great grandchildren. Laura and Leland spent the first 50-plus years in Lund, Nevada where they raised their family. In 1958 they sold their family farm and moved to Orem, Utah where they spent more than 50 years. They enjoyed making new friends, BYU plays and sports, and being close to the temple. Laura had a tremendous thirst for knowledge. She attended grade school and up to the eight grade in Lund. She then went to St. George for a year and then back to Lund. She was a member of the junior class at Brigham Young High School in 1920-1921. Over the next few years she attended Utah State University, the University of Utah, and BYU. She then began teaching back in Lund. When she was very young, she had a desire to play the piano. No teachers were available, so using books her sister Ina had left at home, she began teaching herself to play. She became proficient enough that she was able to teach all of her children and several of her grandchildren to play. When she was a young mother, living on a ranch 35 miles from the nearest town, she ordered a violin out of a catalog and taught herself to play that. She taught some of her children to play, and they in turn have taught their children and grandchildren. Because of Laura, many of her posterity are very competent musicians. 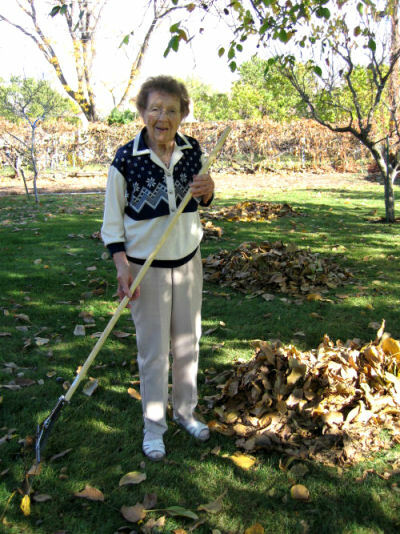 In her later years, when she was a worker in the Provo, Utah Temple, she became aware of a need for more people who could help with the Spanish-speaking patrons. Laura started studying Spanish on her own, and became proficient enough to help in the temple. Laura was actively involved in the LDS church throughout her life. She served in all of the Church organizations and was a ward president in the MIA for 6 years. She and her husband Leland served a mission in South Carolina from 1960-1961. 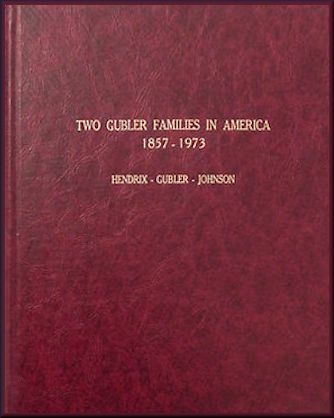 She became involved in genealogy and family history and compiled a large book of her father's family history titled, "Two Gubler Families in America 1847-1972." A funeral honoring Laura's life was held in the Lund, Nevada LDS Chapel on Friday, May 10th. The family suggests a memorial donation to the Perpetual Education Fund of the Church of Jesus Christ of Latter-day Saints.